Over the course of our marriage, I have decorated our bathrooms many different ways. A frog bathroom, a princess bathroom, and an all blue bathroom. I have changed it up so many times because I never found something that I really loved. Just recently I decided to change up our bathroom upstairs and I wanted to go for a more classic look. 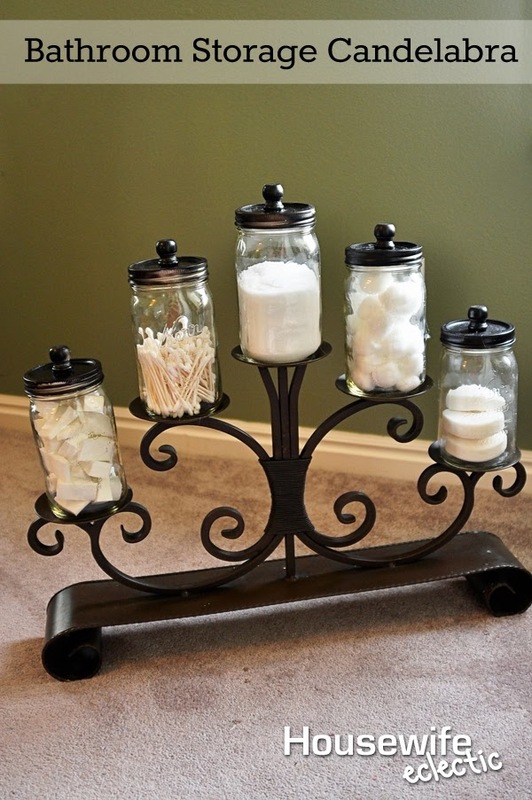 I came up with this candelabra for some of our most used items and I absolutely love it. It completes the look of the bathroom and looks really nice and I didn’t have to spend a lot of money on it. 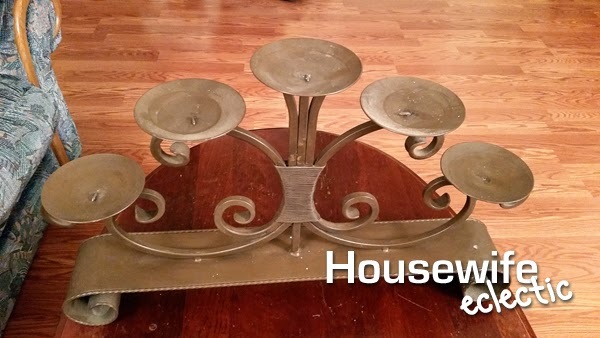 I began scouring the thrift stores around me for a piece meant for many candles. I found a few I liked, but this one really spoke to me. I brought it home and cleaned it up. I decided I liked the brown enough to not spray paint it, but I would have thrown on a coat of Oil Rubbed Bronze spray painted if it had needed it. The first thing you need to do is bend the spokes meant to hold the candle. 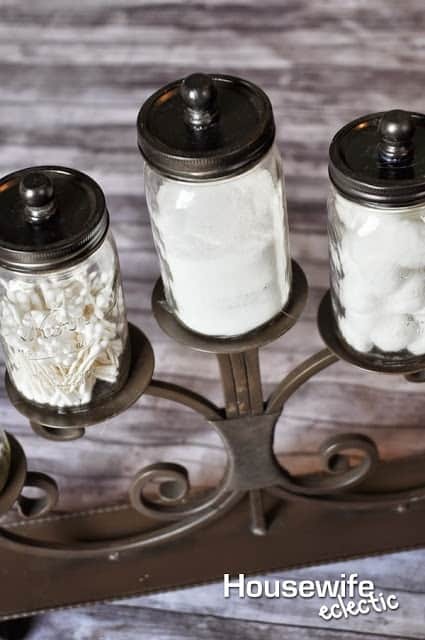 Using a pair of pliers, bend them against the metal of the candelabra, this will give you a flat surface to glue your jars. Then you need to decide what kind of container works best for your particular piece. I tried out a bunch of different options until I found one I loved. 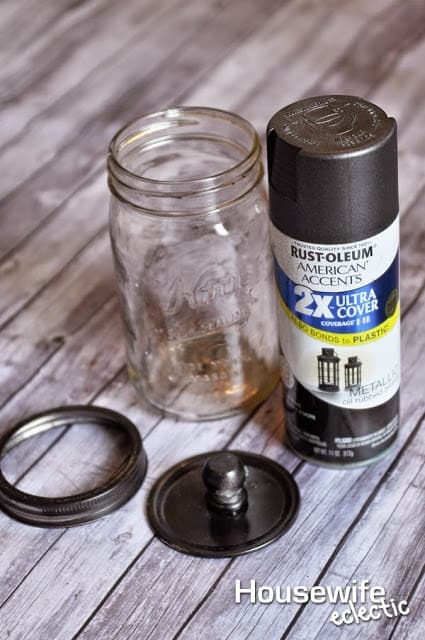 Hot glue a knob on top of your lid and then spray pain the lid with oil rubbed bronze spray paint, or whatever color you need it to be to match your piece. Fill your jars with your bathroom essentials. 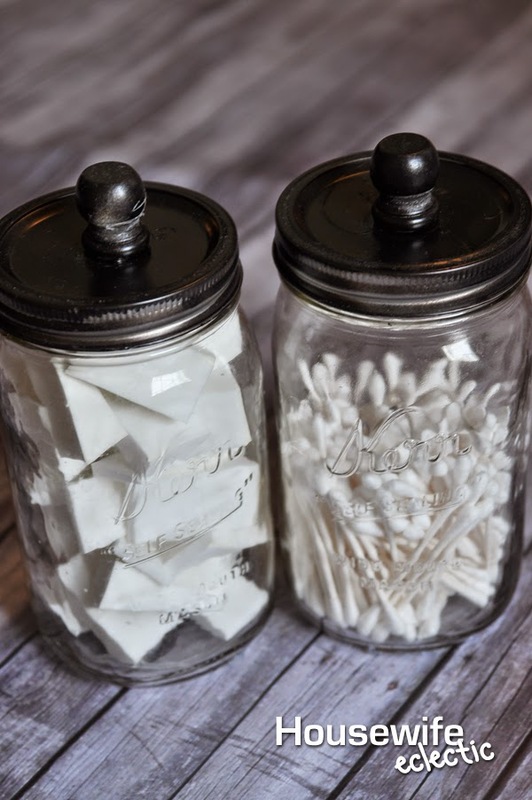 I decided I wanted to go with an all white theme in the jars, so I filled them with cotton swabs, make up sponges, bars of white soap, epsom salt and cotton balls. 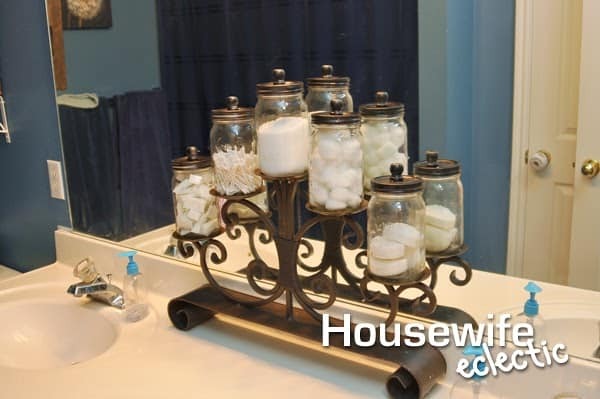 Hot glue the bottom of your jars to the candelabra and then add it to your bathroom for a fantastic statement piece. Along with this gorgeous statement piece and a new dandelion painting, I am finally in love with my bathroom decor. How do you accent your bathroom? That is a really neat idea. I love it. What a darling project. I would love to make that for our guest bathroom. It'd be a great way to provide guests with everything they might need. I love the way you think! 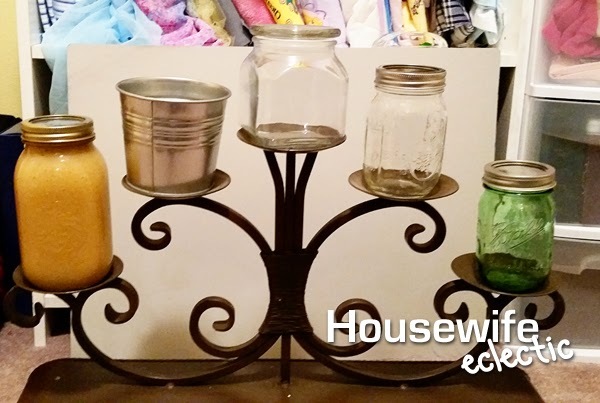 This is such a great DIY project. Thanks for sharing! That is such a great idea. I would have never thought to use a candelabra like that. That is a really cute way to display things in the bathroom. I like it a lot! I'm glad you mentioned hot gluing the jars. I certainly wouldn't trust myself otherwise. It looks fabulous! What a creative idea! I really like the way you created something so amazing and practical. Nice work! What a unique DIY crafts and I had no idea it was DIY, totally thought it was store bought. love this!! already shared with a few friends. That's a really cute idea for keeping things out where you need them. How useful and pretty!! I would love to make this for my bathroom!! 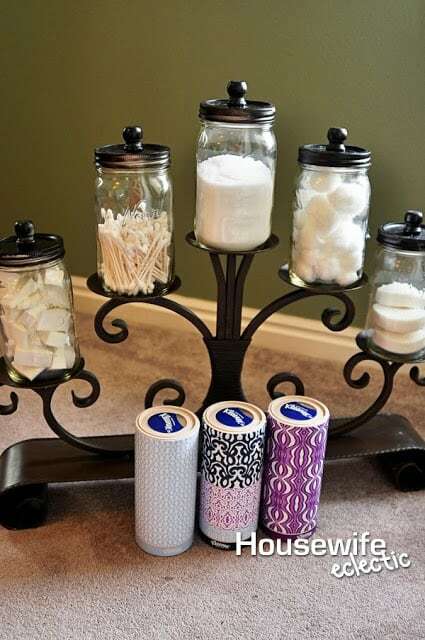 What a great storage idea! Functional and it looks great! That is a brilliant idea! It looks so cute and keeps things so organized! I love DIY projects too. We just moved and I was just looking for a great piece for our bathroom. Thanks for the inspiration! This is such an adorable idea! Add a little class and all the function to your bathroom! Such a cute ideas for organizing! I have been searching for a candle holder like this for months any suggestions?